Since 1990, the Hispanic population in small towns and rural areas has more than doubled. Between 2000 and 2006, total population in small towns/rural areas increased by 3 percent, but the Hispanic population in these counties grew from 2.6 million to 3.2 million, a 22 percent increase. Hispanics made up more than one-half of the people added to the U.S. rural population through both migration and births between 2000 and 2010. For a congregation that has been predominantly white since its beginning 75 years ago, this dramatic introduction to a Hispanic landscape can almost be overwhelming. Not by their mere presence, but by the perceived obstacles that reaching them seems to present. What about the language and cultural barriers? How are these best addressed? Overcome? Perhaps it would be best to do nothing. Or, perhaps the answer to these questions begins with understanding that when you open yourself to possibilities greater than your own ingenuity and skill set, you open yourself to an opportunity to partner with God. This is exactly what the Carnegie church did. The rest of this story is about a series of events God orchestrated in response. In March of this year a handful of students from Oklahoma Christian University partnered with RAM and spent their Spring Break in Carnegie and nearby Ft. Cobb, OK on mission. 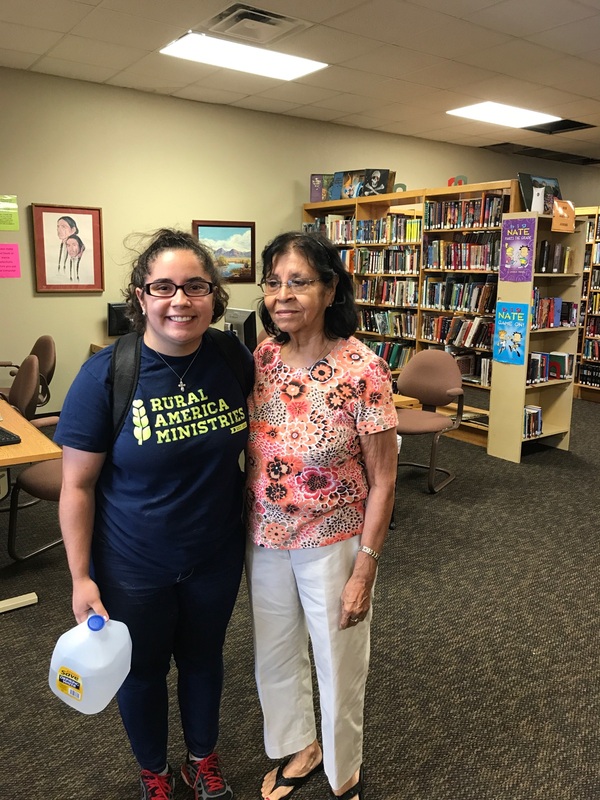 They spent their time going door to door conducting religion surveys, clearing an empty town lot in Ft. Cobb of debris and a fallen tree, and serving at a banquet to honor the senior members of the Ft. Cobb congregation. 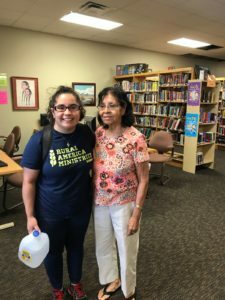 Among those students was a young lady named Isabella Preciado. Isabella stood out from the beginning, but not because of her size. (She can’t be much over 5 ft tall, if that!) Whatever she lacks in height she easily makes up for in heart. She is a courageous and faithful young woman! I’m impressed by how she genuinely loves and cares for others and does not hesitate to put herself on the line if there is an opportunity to show someone else the love of Jesus. As you would expect, she quickly made an impression on the people of Carnegie and Ft. Cobb and it was every bit a part of God’s bigger plan. Within weeks of this Spring Break Mission, Brian King, the evangelist for the Ft. Cobb Church of Christ came up with a great idea. 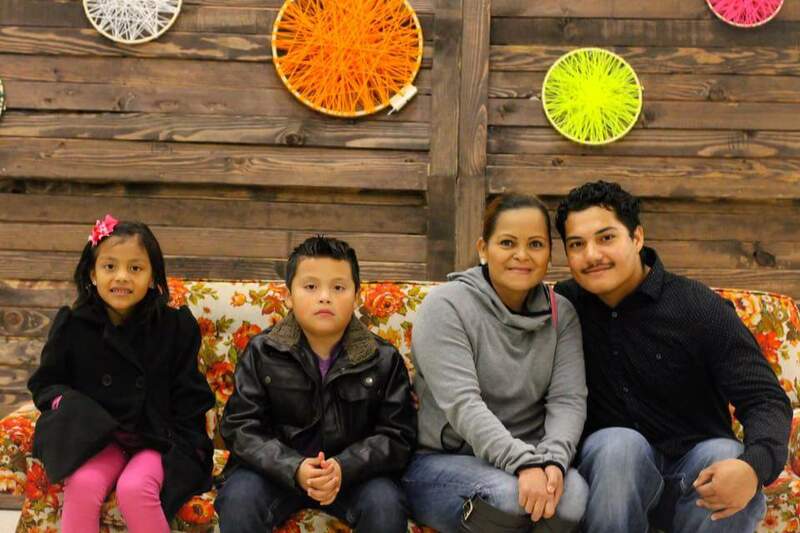 What if the church offered free English lessons to the Spanish-speaking folks in town? What if Isabella taught them? You see, little Isabella was bi-lingual. Originally from Columbia, South America, she was adopted by an American couple living in Florida when she was an adolescent. Even then God was orchestrating events that would eventually lead her to rural western Oklahoma. Who could have imagined? If only more disciples would try! Within days of Brian’s “what if” moment two key events occurred that opened an incredible door of opportunity for the Kingdom: a summer internship for Isabella in Canada fell through and the Carnegie church offered to hire Isabella for the summer to teach free English lessons in Carnegie. By the first of May Isabella was living in Carnegie and teaching English to 10 Spanish-speaking students at the donut shop on Main Street. Then came June and the Carnegie church hosted its first VBS in over 50 years! RAM’s Summer Missions team of 8 college students registered children, decorated the building and taught and supervised the children. 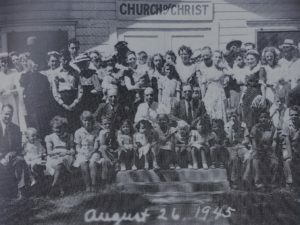 This little congregation of 11 members had 38 children in attendance; the majority of them with names like, you guessed it, Chavez, Lopez, Olvera . . .
Last night I witnessed the Carnegie Church of Christ’s first night of “Fall Focus.” This is an outreach to the children of Carnegie that RAM helped the church envision and organize. 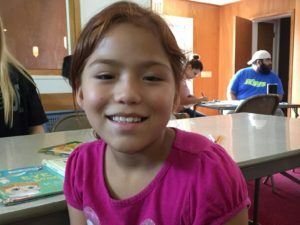 It’s building off of the previous outreach efforts of the spring and summer and specifically focused on the needs of the children. It begins at 3pm every Thursday, with children walking across the street from the school to the church building and receiving free tutoring for school work, supervised recreation, a snack and bible lessons. 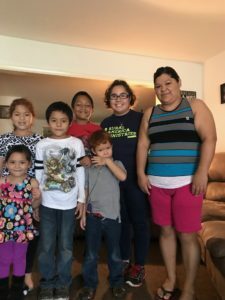 Last night at the kick-off, 19 children showed up! 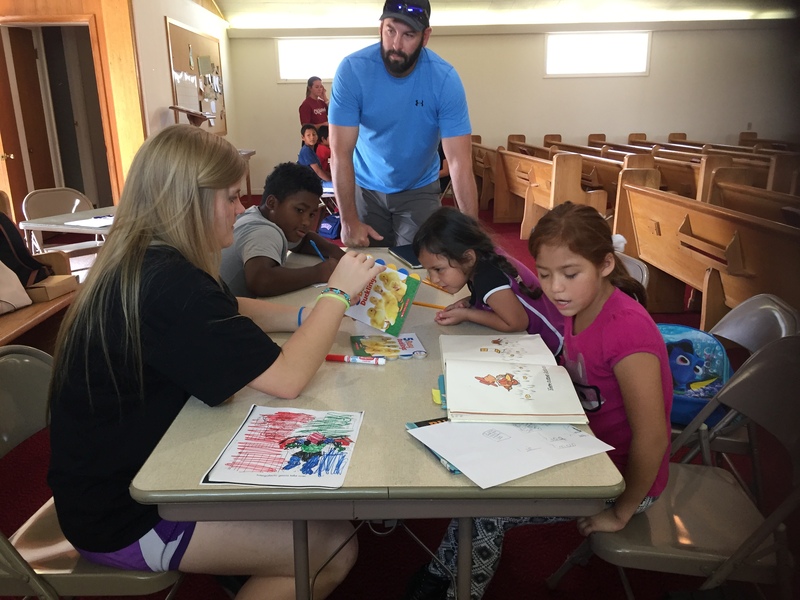 Five students from SWOSU’s Bulldogs for Christ campus ministry in Weatherford came down to help with the children. 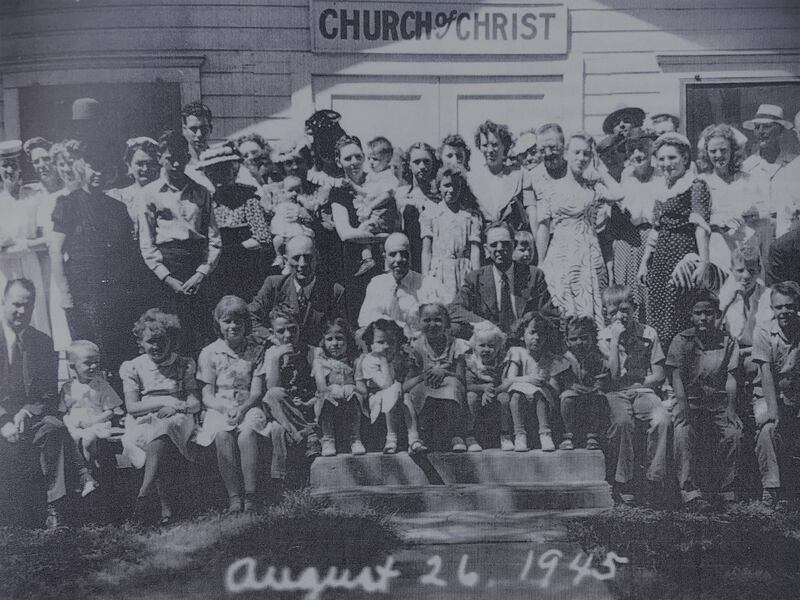 Consistent with recent statistics regarding shifting rural demographics and the recent experience of the Carnegie church, the majority of the children were Hispanic. What do we need to learn from this? First, when you open yourself to possibilities greater than your own ingenuity and skill set, you open yourself to an opportunity to partner with God. Second, there is a shifting demographic in rural America, specifically among Hispanics. This offers incredible opportunities for rural churches to build the Kingdom as they partner with God, seeing not insurmountable obstacles, but opportunities for redemption. Disciples in Carnegie through steps of faithful action are witnessing what the Holy Spirit can do through such faith. Thank you little church of faith in Carnegie! Thank you Isabella, student of faith! Thank you great God who works through our faith! Oh, and did I mention that the parents of two of the children who started coming to the church’s events this summer were at church services last Sunday?